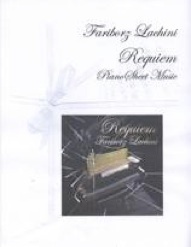 Requiem 3: Piano Sheet Music is the companion sheet music collection to Fariborz Lachini’s CD by the same name. The eight original pieces are composed in a neo-classical style that is rich, very expressive, and fun to play. In playing this music, I found that several pieces reminded me of specific classical composers in places, so it was very enjoyable to guess the inspiration for each piece. In keeping with the theme of the CD/sheet music book (a requiem is a work that is composed in honor of someone’s death), most of the music is melancholy, slow, and very emotional. Lachini has been composing music for soundtracks for quite some time, and some of these pieces would fit a soundtrack beautifully. These are note-for-note transcriptions prepared by David Shenton, so what you hear on the CD is what you play from the sheet music. None of the pieces are what I would classify as simple, but pianists of a late-intermediate/early advanced playing level will find much to enjoy in this book. As I mentioned, most of the pieces are slow and very expressive, and the dynamics are clearly indicated. Some of the rhythms are a bit complex, with triplets and short but rapid figures, but the left hand plays a lot of running eighth notes, which actually simplifies the timing. Trills and grace notes are fairly common, and a few pieces have occasional stretches of more than an octave, but these are not so frequent that they become a problem. Pieces are composed in a variety of keys, and there are a few areas with notes on extended leger lines, but players can certainly pencil in the names of any of the notes they do not recognize. Pianists who are fans of Fariborz Lachini will spend many pleasurable hours playing and enjoying this music. Some of my own favorites to play are “Farewell to Past,” “Secrets and Dreams,” and “Shadows’ Fate.” Requiem 3: Piano Sheet Music is available from lachini.com. Recommended!